The black palm hardwood was introduced to the shop this year via a request from one of our @Twitter supporters and customers. 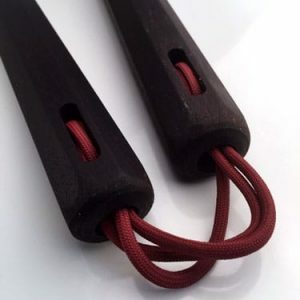 Making a Black Palm Nunchaku was an experiment that turned out wonderfully. All hardwoods have certain properties that effect how well they feel and how well they can be used. 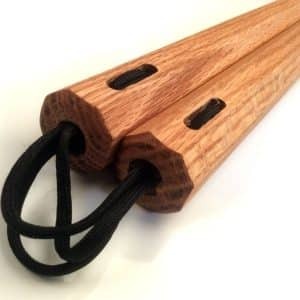 A good martial arts weapon needs to be strong yet flexible. Hardness is also good but not at the expense of being to ridged which tends to lead to shattering. 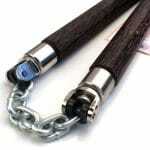 While the Black palm has great weight, it also has the large pour-us grains and fibers that give it flexibility. The following are the specs for the tree itself. Basically it’s a palm tree from Asia and Africa. (Borassus flabellifer) Common Name(s): Black Palm, Palmyra Palm Scientific Name: Borassus flabellifer Distribution: Tropical Asia and Africa Tree Size: 65-100 ft (20-30 m) tall. As we experiment with this great hardwood the Black Palm Nunchaku will gain some new sizes and options as we progress into the Autumn for 2018. 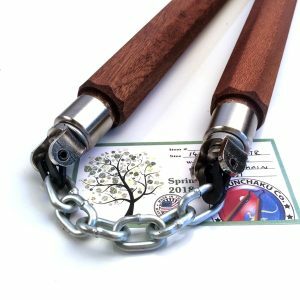 If you are experienced with the nunchaku and want to experiment with some new hardwoods, this Black Palm is a great find. 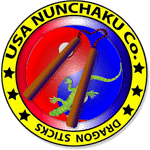 Beware, the Black Palm Nunchaku are very heavy and thus, unforgiving. Take care with fancy tricks and katas until you get used to the weight. Currently the black palm is offered in rope and chain nunchaku types with some variations of 12 inch and 13.5 inch lengths. 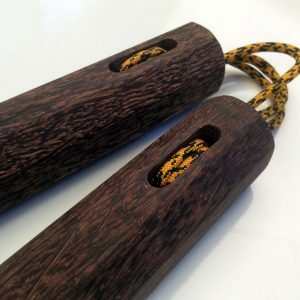 The rope colors are customer choice but many have opted to go with the leopard or cheetah colors as they tend to match the natural colors of the hardwood’s grains. 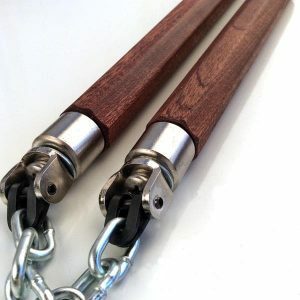 The black palm nunchaku, “nunchucks” will be on sale till the end of the month for those interested in trying out a wonderful and unique new nunchaku hardwood. 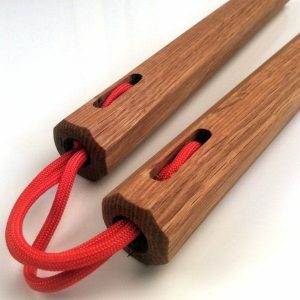 These nunchkau are guaranteed to stand out in the crowd and make a bold statement.